Club Penguin Cheats by Mimo777 Club Penguin Cheats by Mimo777: Club Penguin Community Garden Tree Grows Again! The tree is still growing. It is about to grow off of the screen, so my prediction is it will start blooming soon. What do you think it will grow? Possibly 'O' berries, pizza, pudding pops or maybe spaghetti? Yum, I do love spaghetti! Awsome :) I think it will grow them flowers that eat flys haha! But this one might eat penguins!!! Also, the adventure party is gone, go to the forest and you will still see the new entrance to the underwater room thing in the mine. Credit Stickers303! at 3:12pm PST in avalanche the town was not party themed yet all other palces around the island were! And, if you walked into the dock, snow forts or night club it was party themed. MAJOR GLITCH. Oh, nope. I didn't see that glitch. Wow the tree is growing fast. If it grows any faster it will probably grow big and wide enough to knock over the Mine. Yeah, so move the rock at the Forest, and you will be at the Hidden Lake. Also at the Hidden Lake there is a rope ladder to access the Forest! lol! It would be a good prison hold for Herbert. Just without the eating. *Then all of a sudden it eats a penguin* Help me! I don't belong in prison! Yep, saw that. Pretty cool huh? Is it me or is the rock a little bigger then it was during the party? Eh, I dunno, maybe it's just me. o and you guys i told mimo this thanks mimo for lisening to me! i saw it!! i hope it grows pizza! OK, you told me to comment! So here it is dude! :D I won't be able to mod today probably, hope you understand! i hope it grows money and choclate. REALLY?! that is soooooo cool! Im thinking dat da tree is gonna be apart of da card jitsu water! !I didnt c da glitch but dats like so KEWL!! :) :) back to da card jitsu water i think so since plants need water it could also be a CARD JITSU WATER PLAYING CARD.0O yea is it me or the statue of herbert growing more vines?!??!? while i was at the mine shack today, i was getting a new outfit ready and when i had my player card up a heard something big. I heard leafs shifting and when i put my player card down the tree had changed! Too bad my player card was up though. I no dis is nothing to do with this situation but how do u answer a question if ur comment dosent go under the persons question. I wish I saw the glitch. I SAW THE GLITCH IT WAS SO WEIRD!! a bunch of penguins were like????? and it wouldnt let you. It was right after the party was over and they changed it back after a while. Yep. If you go over to the little Sports shack they have the calalog will pop up. It's a mini Sports Shop! Ok, i'll try to make it! And your not going to mod today? Noo! Come back quick! By the way, I might sneak into your Twinky collection while your gone. Im sure you will understand. Hey everyone!!!! If you want to meet me on Club Penguin, follow me here!!! Me too! Who says money doesn't grow on cheese? And I didn't see the glitch either. I wish I did. I guess theres still a little bit of the Sport Shop left in Club Penguin. Or maybe it's the Sports Shop's ghost! It came back to haunt whoever blew it up with popcorn! O, then we got nothing to worry about. Really? Weeiirrd... Keep an eye on it next time it decides to get bigger. What you want to do is copy and paste it. How do you do that you may ask? What you do is hold down the left clicker of your mouse and go over the comment. When its highlighted right click it and press copy. Come to the comment box and right click it and click paste. The comment is already there! *Clap clap* Thank you, thank you. Lastly divide the comment with lines and reply to it. Good luck! That would be cool. *Presses button* Why isn't it working. *Click click click* Err! *Waddles over to where elevator should be, click click click click click click* Hmm. I wonder why it's not, *WHAM!!! * Ow! My beak! -------------------------------------------------------------------------mimo already posted that but it's cool how you are finding things like that,! 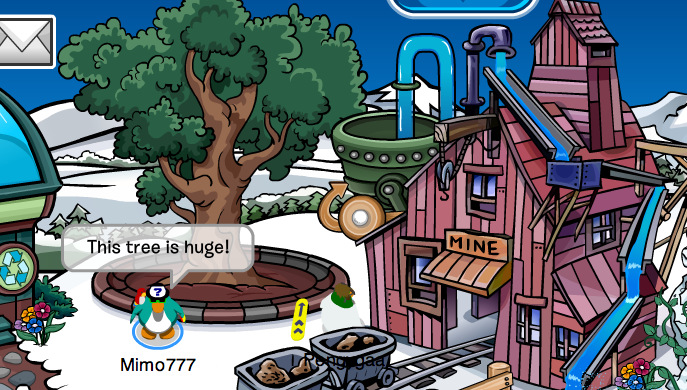 i was on cp today and the epf building was there. I went in it with my non member to be an agent. Maybe it was the sports shop for only a little while. Awesome. I just wanted to say that I have been doing alot of research and I think Aunt Artic is the director. The one incharge of the PSA. mimo when the glitch was there you couldnt walk in but you could go through epf room to go to the phone faculity and you could walk out. it was soo cool! I noticed that the tree grew bigger too. Do you think it will change leaves in the fall and lose its leaves in the winter? There’s been a rumor going around for a long time about Aunt Arctic actually being the Director of the PSA aka the Penguin Secret Agency. So i decided I would join in and present some facts. Then you can make up your mind for yourself of whether or not you think Aunt Arctic is actually the director of the psa. Ok first off let’s take a look at both the director of the PSA and Aunt Arctic. Again why would this be the case for a quiet old lady working as an editor for the newspaper… very fishy. If you ask me this is some pretty strong evidence. Yes, it’s possible that it’s all a coincidence but for some reason i think there’s a lot more too it. Also there’s something about aunt arctic that just seems fishy in general, she seems so quiet and nice, almost like she’s hiding something…. Hehe im going to your Summer Bash party! I saw that glitch ages ago! It was weird. Oops, I forgot to put my name there. We'll i just did. Phew. I must be tired or something. Don't judge me. I stayed up till four AM last night. I'll be more observant from now on. I believe she is. I've seen evidence and videos about it. That would be cool. I hope it does kinda mimic the seasons of the year. Lol. Iv'e seen the sight where you got all that from. And the last one about one of the Night Club's lights blinking is false. I've tried it before and it doesn't work. And I don't believe it ever has really. But all the other stuff is true. And yes. I do believe she is the Director. And heres one very cool important piece of evidence I bet you didn't know. Do you remember the old HQ music? Well, on a youtube video made by WaffleKing99 and StarWars1722, they found out that if you translated this sentence, Aunt Arctic Is The Head Of PSA, into morse code taps, it made the same taps to the old HQ music. It's pretty cool. If you havn't seen there video look them up. the tile is Aunt Arctic is the director. Scamper52596 said...Oh, nope. I didn't see that glitch. Wow the tree is growing fast. If it grows any faster it will probably grow big and wide enough to knock over the Mine. Mimo7777 i saw Yukon with one person and it said it was full! ?Blizard too it had one barand in a second later its five bars!? Where: Fog, Cove! We will move around! Yeah, and so is Rockhopper... :( I couldn't find the new entrance and I just saw a huge boulder sitting there! LOL. Whoa! They were probably editing it when they accidentally did something wrong! That's odder than the number 3! Neither did I! It was probably only at a small time! I think Card Jitsu water will have to do with a discovery in Aqua Grabber! And it looks like its growing A LOT more! I would like that! Maybe something could lead to the Lodge Attic! That's my favorite room! I REALLY miss it.I've barely even gone into the Phoning Facility! It's probably because of taking away the party! Because the sports shop SWF is still there! It was. It was just a glitch that CP didn't see! I wonder if it had the catalog in it when it was the Sports Shop! That's weird, twisted, warped, and overall, cool!n I can't believe I missed it. Mimo I posted on your last post about the sports shop. Oh and the secret entrance thing was in the newspaper. Haha! Could you access the old command room? I think the tree will get so big all we can see is the trunk and we will build a treehouse. That happens A LOT! It's a huge glitch that CP is trying to fix (I think)! Did you notice that if you click the color party at night club the penguins change colors? Yea, stinks. Hopefully he will come back soon. And by soon I mean tomorrow to pick up something he left. *Friend says,* How do you know he left something? Umm, im pretty sure he will back for something..., I say. *Friend says*, Wait, I don't recall you owning a red puffle... Um, I don't, I say. Yea, thats happened to me. Some kind of glitch. Hopefully that will be fixed soon. Really?I wish i was there. what time was it? hey there is a new field-op!its about a huge light bulb. i went to the beacon but its not working! Mimo there´s a new Field op!!! Cp released it a few moments ago! Hmm well I have the game and I was a EPF member before they made it the PSA kind of. I don't think she is though... maybe it is Dot because you don't see her that much. It would be cool if they had a mission where u became the new Director and you unlock a room that you can invite people into. Hm... I don't know! I noticed that too. It makes it way easier to get to the Mermaid cove. Big tree! I missed the sport shop thinger- majinger. They need to reveal that soon, I'm getting anxious waiting. I've got an idea! What if Herbert was the director for all this time, just brodcasting from Antartica, or wherever he came from! Then, he went bad, and he has this plan to take over CP, making people think it's the director telling them to do that! Sorry, it was really hard to read that. I barely got it. Try checking out the rules for posting. Send this to CP right now, they need to figure out that we know she is the director. This is like awesome. You are going to be famous!Scamper, thanks for the clear up, but I believe both of you in your own ways. With the shady thing and the glasses, maybe she is just a bit of a gangster when she isn't writing, she only has to write two articles a week you know! Yep, it's just you, to me it seems a bit... smaller?! Speaking of water, it never rains in Club Penguin. It only snows for Christmas. I wish the Sports Shop glitch wasn't fixed. I miss CP when the Sports Shop, HQ, and EPF room was there. Hey mimo! i saw the sports shop thing! it was weird! even the old HQ was back! i thought cp was putting back for surprise somehow but the field-ops were oviously gone for then but yeh. P.S yesterday at midnight club penguin revereted into the 2nd version! with the old hq and no ninjas but it only lasted 5 min. ~~~~~~~~~~~~~~~~~~~~~~~~~~~~~~~~~~~ Yeah, and in a field-op you would have to save Rookie, G, and Dot and then kill it. Confusing, right? CP gave us a challenge, the bulb is really at the digging place, if go to mine and through the next room, that room is where it is! Club Penguin Pin Cheat - CANDY APPLE PIN! Club Penguin Ultimate Field Op Reviewed By You! Club Penguin Field Op Number 3! Decompiling Club Penguin for Cheats? NOPE! New Club Penguin Field Op! Rockhopper Returns to Club Penguin! Club Penguin "You Decide" Power Card! June 2010 CPG Mod Shake Up! We love Disney, Don't We? Club Penguin Does! GOOD NEWS! Club Penguin Grows! Club Penguin Giant Squid Spotted! Club Penguin Pin Cheat - LIGHT BULB PIN! News of Club Penguin Island Adventure Party! Club Penguin Mermaid Reviewed By You! Club Penguin Island Adventure Party Sneak Peek! Club Penguin on iPad, iPhone, iPod Touch? Club Penguin Safe Chat Servers! Club Penguin Game Day! on Nintendo Wii! Club Penguin Adds New Room - VR Room! CLub Penguin Reveals Adventure Party Plans! Elite Penguin Force! What's Next? New Room! Disney UK Club Penguin Membership Contest! Club Penguin Lost 1 MILLION Penguins! Club Penguin EPF Report June 15th! Club Penguin Pin Cheat - SEASHELL PIN! Club Penguin News This Week! Let's Rock Out On The Mimo Blaster PARTY AGAIN! Club Penguin Construction Reviewed By You! Club Penguin Paychecks Arrive... for some!